The slow movement of Jupiter along the ecliptic makes its opposition (and prime imaging season) about one month later every year. This year, the season started just about the first of the year. I'll continue to take images until the planet disappears into the San Diego fog in May. This year, I'll compare the images with a Philips ToUcam webcam to the previous year's images with the SBIG ST-7E. Taken with 10" Newtonian telescope, stopped down to 9.5"; 2.5x and 2x Barlow lenses to get F/33; Philips ToUcam used at 10 frames per second, 100 msec exposures, gain 40%, best 669 frames summed, clear skies. (Click on the image to see the first 50 frames). This is the last image of the evening, taken just before the marine layer moved in and obscured the sky. The seeing was average most of the evening, and got better only as the night cooled off due to the hot desert air being pulled back and replaced with the more stable ocean air. The same process brings in clouds, so its important to image until the last minute. Taken with 10" Newtonian telescope, stopped down to 9.5"; 2.5x and 2x Barlow lenses to get F/33; Philips ToUcam used at 10 frames per second, 100 msec exposures, gain 40%, best 669 frames summed, clear skies. This is the only good image taken during more desert winds in poor seeing. (Click on the image to see the first 50 frames). 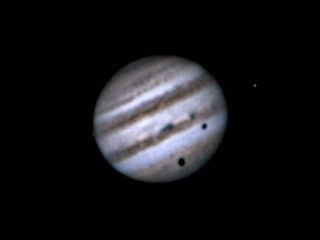 This is the only 2004 image with the Great Red Spot visible, so its posted, even though the image was not very good. Its similar to the best images I've taken on film, about 10 years ago! Taken with 10" Newtonian telescope, stopped down to 9.5"; 2.5x and 2x Barlow lenses to get F/33; Philips ToUcam used at 10 frames per second, 100 msec exposures, gain 50%, best 669 frames summed, slightly hazy skies. 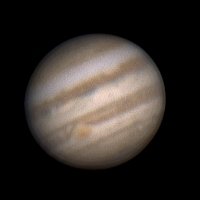 This is the best Jovian image I've taken, during good seeing (estimate 7/10 to 8/10). The clouds that have been around for the last few months dried up a bit just in advance of high altitude desert winds, so before the seeing deteriorated or the foggy marine layer moved in, I had a few hours to capture some images. I was lucky enough to capture this wonderful image. The seeing looked good enough when viewed through only the 2.5 x Barlow that I gambled and added a second 2x barlow to get a plate scale of 0.14 arcsec/pixel. I had to turn up the gain to 50%, but the end result was worth it. For comparison, the steps in the final image processing are shown in the next figure. Note that Jupiter was about 300 pixels across, filling much of the ToUcam frame. The image in the upper left corner is one image taken from the video, selected during a brief interval of excellent seeing during the 1000 frame (100 seconds) movie capture. Click on the image to see the first 50 frames in avi format, demonstrating the good seeing. The single raw image shows little detail due to the webcam signal-to-noise level, but the movie shows that the image is fairly stable and not rippling. This means that only image motion correction is needed to get a pretty good image. (Use Window Media Player, for example, to replay the movie in a continuous loop.) The image in the upper right corner is the result of using K3CCDtools to automatically select and stack the best 669 images. (At this stage in the processing, selecting the best 100 frames actually made a slightly higher resolution image, but the higher effective noise generated more artifacts in the later processing steps.) The lower left image is the result of performing only unsharp masking to the stacked image. This increases the contrast, but does not improve the resolution. This simple step was generally adequate for the Mars images taken last year. To achieve the highest possible resolution, the stacked image was processed with MaxImDL's maximum entropy algorithm, resulting in the image shown in the lower right corner. For the Mars images, maximum entropy did not seem to help, but I suspect that was due to the bright polar cap. In that case, most of the Martian image was much dimmer and the maximum entropy algorithms seemed to ignore it, concentrating on the single bright spot. 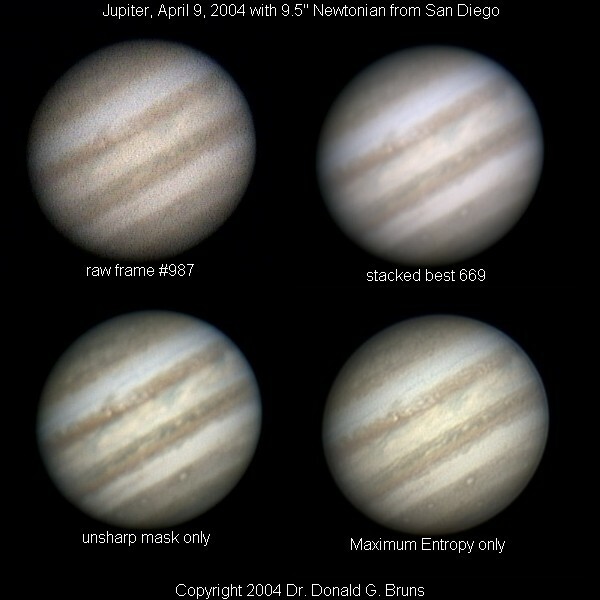 For Jupiter, the disk is more uniform and the algorithm works wonders. The slight ringing seen on the edge of the disk is due in part to the clipped background level in the raw images taken from the webcam. For moderate or low gains, the sky background is clipped before the digitizer, making the black level identical to zero counts. This makes a sharp edge in the signal level, resulting in ringing, even for rather gentle maximum entropy processing. The final step in the processing was to add a little unsharp masking, resulting in the image shown at the top of the page. For presentation, the color saturation in all of these images was increased by 25% and the image sizes reduced by 75%. Hopefully, there might be one ore two more good seeing opportunities this spring, before Jupiter moves too low in the western sky. Barlow 2.5x only, F/15; best 10% of 1000 frames, recorded at 10 FPS, 50 msec exposures (1/33 setting), Gain = 10%, clear skies. Click on the image to see the 6-hour movie (1 MB download). Click here to see the first 50 frames of the single image above, demonstrating the below average seeing during the middle and end of the movie (0.5 MB download). The image was overprocessed to bring out more detail. Seeing was good at the start of the evening, but fell below average for much of the movie, perhaps to 3/10 as a slight desert wind picked up. 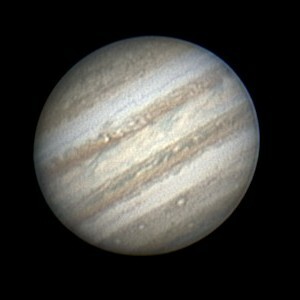 An interesting series of events occured on Jupiter, so even though the seeing was poor, it was worth recording. Starting at 7:03 pm, I took a 1000 images series (100 seconds) precisely every 3 minutes until 1am, for a total of 6 hours, or 120 frames. The images were processed, good or bad, into a movie only 4 second long. The frames were made quickly enough so that the rotation is pretty smooth. At the start, Europa is just visible on the left, but disappears behind Jupiter about halfway through the movie. 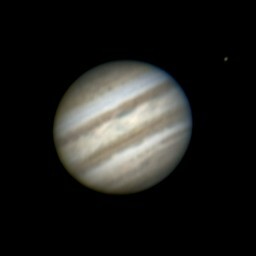 Ganymede and the Io appear on the right side, and slowly move in front of Jupiter. Callisto was too dim, but its shadow appears on the bottom side just as Ganymede goes in front of the disk, looking like a shadow itself. After Io and its shadow appear, Ganymede's large shadow finally enters the disk. You might want to play the movie at a slower playback rate, and enable the continuous repeat mode in Windows Media Player. Barlow 2.5x only, F/15; best 10% of 2000 frames, recorded at 10 FPS, 50 msec exposures (1/33 setting), Gain = 10%, clear skies. Seeing was below average, perhaps 5/10 to 6/10. A slight desert wind eliminated the clouds we have been having lately, but the seeing, as monitored by observing some stars, showed fast, high-altitude turbulence. 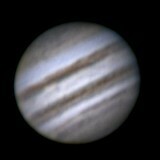 The visible detail is not too bad, boding well for great images on a night of better seeing. Lots of detail is seen in the equatorial regions. Barlow 2.5x only, F/15; best 10% of 2000 frames, recorded at 10 FPS, 50 msec exposures (1/33 setting), Gain = 10%, clear skies. Click on the image to see the first 50 frames in the AVI file. Seeing was below average, in part due to light desert winds and the planet being still rather low on the horizon (42 degrees). Since the seeing was a little better than for the January 11, 2004 data, Io was just visible in real time, jumping in and out of visibility. In fact, that is how I focused the camera. 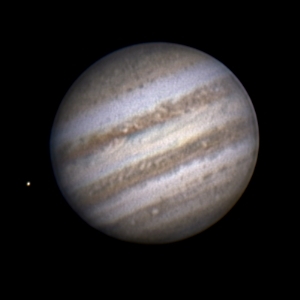 Ganymede and Europa were also visible in the full frame, seen in the video clip. An interesting blue feature is visible near the meridian near the equator. Barlow 2.5x only, F/15; best 10% of 2000 frames, recorded at 10 FPS, 50 msec exposures (1/33 setting), Gain = 5%, clear skies. Click on the image to see the first 50 frames in the AVI file. Seeing was below average, since the planet was so low on the horizon (36 degrees). A series of 2000 frames were taken over 200 seconds, resulting in a shift of about 0.7 arcsec at the equator on the meridian. This would be a little too long for the highest resolution (100 seconds results in 0.4 arcsecond motion, or about 0.2 arcsec smear), but since the seeing did not support high quality, the longer series was used to help select the best frames. At this gain, Io was not visible, since the webcam clips low level signals. The raw sum showed no features, and a very strong unsharp mask was required to bring out the clouds. When the planet rises earlier and the seeing is better, the webcam should perform well. If the 2x Barlow is added, a 100 msec exposure with 50% gain is needed, which should raise the background noise enough to see the moons. All text and images are owned by Stellar Products, 1992-2004. Any use by others without permission of Stellar Products is prohibited.